Witches' Legacy: Dark Days to Come Collector's Edition is the 8th release in the Witches' Legacy series from Elefun Games. It has been quite a long series so far. It is also one of the more interesting ones out there. This new release unfolds yet another battle between good and evil and invites you to take part in it. There is a bonus chapter where you go to a sunken city. Well, it is more like it forces you to play your role in some evil developments in a magical realm when your girlfriend is kidnapped. Anabel (your girlfriend) allegedly has a pure heart that can help evil ice twins. She is supposed to be used to restore the power of the dark witches and eventually bring the human world to an end. How can you let it happen? You jump right into this mess to rescue the girl and the world with her. The narrative isn't really one of a kind or new in any way. Nevertheless, some players will enjoy it very much. There is a bonus chapter where you go to a sunken city. The whole game looks very colorful - a lot of blue and yellow. The voice overs and sounds are great. While the main story is quite dark, the game is not creepy or horrifying, which is great for the younger players. The game has a lot of work for you to do gameplay wise. 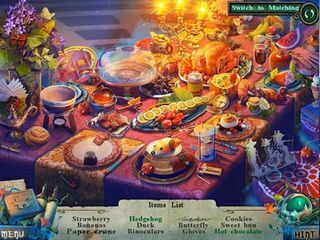 While the mini-games seems to be rather easy (not necessarily boring), the hidden object scenes offer quite a lot of variety and interaction. Some found items give you pieces for a puzzle, others are highlighted words in a text. 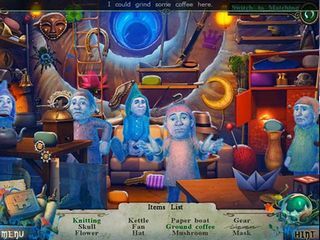 Collectibles include morphing objects and items for your helper in addition to the puzzle pieces. There are achievements to challenge you even more. You get a map and a strategy guide if you need help. The map is quite helpful because it shows you places that still have action or collectible items for you. The media extras include wallpaper, screensavers, soundtracks etc. The game is available in the usual four modes: Casual, Normal, Hard, and Custom. The hints (10-35 seconds) and skips (10-50 seconds) are adjustable, too. 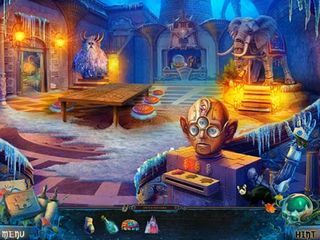 It is a neat hidden object puzzle adventure game, but some players might find it not so interesting as the story never ending. This is Witches' Legacy: Dark Days to Come review. Download this game here.